The final round of the 2012 FIA World Rally Championship takes the contenders to the coastal resort of Salou for RallyRACC Catalunya-Costa Daurada, Rally de España. This is the only true mixed surface round of the series, with Friday’s opening day of competition run on gravel and the following two days contested on asphalt. As a consequence, final service on Friday has been extended to give the teams the opportunity to change the cars from gravel to Tarmac specification. This year’s itinerary includes two new innovations; the start ceremony moves to Barcelona, the capital of Catalonia and the second largest city in Spain, and an all-new super special stage has been introduced on the beach-front in Salou. Rally de España is the only event this season that will play host to all three support Championships. While the WRC titles have provisionally been won, and Elfyn Evans has claimed victory in the FIA WRC Academy Cup, the winning co-driver in this series will be decided in Spain. Additionally, the fight for the FIA Super 2000 and FIA Production Car World Rally Championship titles will go to the wire in this, the final round of the season. This year’s route will remain familiar to the crews, with some modifications to stages run last year. However there are two new stages; the seven kilometre Gandesa (SS1) that opens the event on Friday, and the two kilometre Salou stage (SS6) – run over both gravel and asphalt – which concludes the action the same day. In Spain, the Power Stage is the penultimate stage of the event (SS17, Santa Marina). The final round of the 2012 World Rally Championship, Rally de Espana will also see Sébastien Loeb and Daniel Elena’s last full season in WRC draw to a close. For the Citroën Total World Rally Team, it will be very much the end of an era, and one which has seen nine consecutive Drivers’ World Championships* won by the Franco-Monegasque crew. It goes without saying that Seb and Daniel will be looking to finish the year in style in Catalonia, just like their team-mates Mikko Hirvonen and Jarmo Lehtinen, recent winners of Rally Italia. Part of the WRC calendar since 1991, this year sees Rally de Espana play host to the finale of the World Rally Championship for the first time. Although the titles and the main podium places have been decided, the event looks set to be a huge end-of-year party, driven by the passion and enthusiasm of the rally-mad Catalan fans. The rally keeps the mixed surface format adopted in 2010, the first leg being held on gravel, followed by two days on tarmac. There are several new features in 2012, the most significant being that the ceremonial start will now be held in Barcelona on Thursday evening and there is a new stage on the seafront in Salou, the seaside resort hosting the service park. After Sébastien Loeb, Daniel Elena and Citroën won the WRC titles at the Rallye de France Alsace, Mikko Hirvonen and Jarmo Lehtinen confirmed that they would finish the year as runners-up by winning in Sardinia. Although Loeb and Hirvonen have almost become accustomed to finishing first and second at the end of the season, this one-two finish in the Drivers’ World Championship is a first for the Brand. Ford aims to end its official participation in the FIA World Rally Championship on a high note next week when the 2012 season comes to a close in Spain. After the decision to stop its factory team at the end of the year, Jari-Matti Latvala and Miikka Anttila and team-mates Petter Solberg and Chris Patterson have targeted a successful finale at Rally de España (8 – 11 November). Ford has already secured second in the manufacturers’ championship with the Fiesta RS World Rally Car. The destination of the title and the runner-up placings in the drivers’ series have already been decided, but both Ford pairings are involved in a three-way battle for third. Thirteen points cover the trio, with a maximum 28 available from Spain. Rally de España is based in the Costa Daurada holiday resort of Salou, south-west of Barcelona, and is one of the most varied rounds of the season. Traditionally a pure asphalt fixture over smooth and flowing roads in the Tarragona region, it has evolved into a mixed surface event in recent years with the introduction of gravel speed tests. Friday’s opening leg is 90 per cent gravel, with several short asphalt sections included. The most demanding challenge will be the 44.02km Terra Alta special stage which includes three surface changes. Latvala and Solberg’s Fiesta RS WRCs will be prepared to full gravel specification for the day, after which the team will convert them to asphalt trim for the final two legs. The sealed surface roads are fast and can be compared to a race circuit in their characteristics. They are smooth, often abrasive and can become slippery as drivers cut corners to save vital tenths of a second, dragging stones and dirt onto the surface. Latvala is nine points ahead of Solberg in the points standings and the 27-year-old Finn is confident after what he described as his best asphalt performance en route to second in France last month. He finished third in Spain last year, his best result there from eight starts. “It’s a dream of mine to win an asphalt rally and I’ve always thought that Spain could give me the best opportunity,” he said. “But to be able to challenge I must be in a good position after the opening day on gravel. A strong first leg will give me a platform from which I can go out and do my best over the last two days on asphalt. “The roads are smoother and wider than elsewhere in the series. They’re well used by the public so they’re maintained to a high level. A lot of repair work has been done to ensure there are far fewer places where we can cut corners, there are only a couple of stages where this is possible now. Cutting drags a lot of dirt onto the roads and so this means conditions are more even for all of us. Latvala completed more than 200km of testing on Wednesday in mixed conditions. “It was damp and cool in the morning and full dry later in the day. It was good experience because the rally is later in the calendar than normal and those are the type of conditions that we will likely encounter,” he added. Solberg has plenty of Spanish experience, the 37-year-old Norwegian preparing for his 11th start. His best result was in 2010 when he finished second. He is buoyed by a 250km asphalt test on Tuesday, which he described as ‘the best test session of the year’. “I really enjoyed the work we did and it’s given me extra confidence for the rally,” he enthused. “My target is clear – to go there and try to win. That’s more important to me than chasing a medal for finishing third in the championship. If I take third in the points, then that’s a bonus, but a gold medal for winning the rally would mean more than a bronze in the championship. “It’s the final round and both titles are decided, so there will be a lot of people with nothing to lose who will be pushing hard. It’s a great rally and the asphalt is fast and smooth. It’s the closest the WRC comes to competing on a race circuit. Mixed surfaces bring something different to the series, but I’m not keen on gravel and asphalt in the same stage. It should be one or the other,” said Solberg. Five MINI John Cooper Works WRCs will line up at this weekend’s Rally de Espana – the final round of the 2012 WRC. As usual, Chris “Atko” Atkinson and Paulo Nobre will line up for WRC Team MINI Portugal. “It might be the last event on this year’s calendar, but as always we’re approaching it head on with maximum focus,” said Team Principal Bruno de Pianto. “It is the only rally run on mixed surfaces. That puts us under great pressure when we do the set-up switch on Friday night.” While the first day of the rally is held on gravel, tarmac stages are scheduled for Saturday and Sunday. The changes to the cars must be made at the double. “We have a one hour fifteen minute service, so everyone needs to be 100% committed and concentrated,” said Bruno. Not only must the tyres be changed during the service, but the dampers, springs and anti-roll bars must also be adjusted. The MINI John Cooper Works WRC is also fitted with a new sump guard and the set-up of the gearbox and differential is also modified. Only nine timed kilometres are new this year. Most drivers, including Dani and Paulo, are already familiar with the remaining 396 kilometres, having tackled them in previous years. Only Atko is starting pretty much from scratch. “Chris has an idea of the rally’s tarmac stages from previous outings, but the last time he competed in Spain was in 2008,” explained Bruno, his Team Principal. “As such, he has never tackled the mixed-surface version of the event.” However, Atko is sure to adapt quickly to the conditions – all five MINI crews have been fine-tuning the set-up of their MINI John Cooper Works WRC in Spain since Monday. M-Sport Ford World Rally Team will be looking to finish the year with another strong result next week as the FIA World Rally Championship (WRC) journeys to the season finale – and the only true ‘mixed-surface’ event of the year – at the 2012 RACC Rally de España. Assuming its new position as the WRC’s closing round, Rally de España presents a real challenge for crews and technicians alike. On the opening day, flashes of asphalt disrupt the predominantly gravel stages meaning that the drivers will need to contend with continuous adjustments to their driving style and technique. Moving to the smooth asphalt roads in the hills north of Tarragona, the final two days of competition will see wide, flowing stages demand expert lines and precision from the crews whilst allowing the team to lower and stiffen the suspension in search of higher speeds. Yet with this year’s later date holding the prospect of damper conditions, the polished asphalt has the potential to become treacherously slippery – adding to the challenge and being sure to provide some intense competition as the crews do battle for the final spoils. The challenge of dual surface rallying will also see the team decipher a number of factors to determine the optimum set-up – as well as the intricate task of converting each Ford Fiesta RS WRC from its gravel to Tarmac specification in just seventy-five minutes – to ultimately provide a rally car that performs to the best of its ability on both surfaces. Showcasing their speed and composure on the previous round in Sardinia, Ott Tänak and co-driver Kuldar Sikk have proven that they have the skills to contend with the challenges ahead. After securing his first podium behind the wheel of his Ford Fiesta RS WRC, the Estonian will be hunting seventh place in the Drivers’ Championship – a position he trails by just one point going into the final round. With an impressive track-record on asphalt, the 25-year-old will be out to impress. Taking the coveted Power Stage win on the previous sealed-surface outing in France and securing two stage victories in Germany, Tänak is hungry for further successes and will be looking to end his season on another high. Joining the team in Spain, John Powell and co-driver Michael Fennell will be hoping to make the most of their first venture to the WRC. Taking to the wheel of the Ford Fiesta RS WRC, the pairing will be aiming to gain a wealth of knowledge and experience which they can harness in their regional championships as well as another potential assault on the world stage. This will be Powell’s first outing on the Spanish event, and with the majority of his rallying experience on gravel, the Trinidad and Tobago driver is relishing the challenge. The long stages will also pose a test for Powell as much of the rallying in his homeland is contested over short six to seven kilometre stages. But with the M-Sport team behind them, the pairing will be looking to complete a trouble free rally with a solid result for the Cumbrian squad. “I am feeling pretty good ahead of Spain. We didn’t have a perfect start to the season, but recently the feeling has been getting better and better so I hope we can continue improving. “We had to Super Rally last year so some of the stages will be completely new to us. The Tarmac stages are really nice to drive – flowing roads where you can carry a lot of speed. The gravel stages are obviously a little different – they are a lot narrower with a mix of high and low speed sections. “This will be my first WRC event so I think it is fair to say that I am pretty nervous! We’re trying not to think too much about what to expect, we’ll just be hoping to gain some good experience and get to the end in one piece. “I’ve been at M-Sport this week and there has been a lot of talk about a certain Jamaican bobsled team. Nobody thought there would be a Jamaican bobsled team and who would have thought that someday there would be a WRC driver from Trinidad and Tobago! The bobsled team finished dead last, but they had a great time doing it and made a pretty big impression on the sport. Maybe we can do the same – and maybe one day they will make a movie about us too. Newcomers to the Citroën Racing family, Hans Weijs Jr. and Bjorn Degandt will be drawing on their experience to produce the goods on the Costa Daurada stages. For its twelfth rally of the year, the Qatar World Rally Team’s DS3 WRC will be entrusted to Hans Weijs Jr. and Bjorn Degandt. With 26 World Rally Championship events under his belt, the 25 year-old Dutchman already has plenty of top-level experience. Competing in a Citroën C2-R2 MAX and a C2 Super 1600, his three seasons in J-WRC have allowed him to hone and showcase his driving skills, which helped him to finish as Championship runner-up in 2010. The final round of the 2012 season, Rally de Espana will provide the crews with the last opportunity of the year to showcase their talents. With fourth position his best result to date, Thierry Neuville and Nicolas Gilsoul (Citroën Junior World Rally Team) will be determined to finish on the podium in their DS3 WRC. Hosting the final round of the World Rally Championship for the first time this year, Rally de Espana offers a full menu to the competitors. After a first leg held predominantly on gravel, the cars will be converted to tarmac configuration for the next two days. The rally is famous for the wide, sweeping circuit-style roads of the province of Tarragona, and it is an event at which Citroën has an excellent record. The BWRT’s Brazilian driver Daniel Oliveira and his Portuguese navigator Carlos Magalhaes are ready to tackle the Rally RACC de España (November 9th-11th) on board the Stohl Racing-run Ford Fiesta RS WRC to see their second season off in the FIA World Rally Championship. As expected for a final round, the Rally de España will push both the drivers and machines to the limits. The competition will introduce for the second time a mixed-surface event to take place in the province of Tarragona, to the Southwest of Barcelona. That is where the event will kick off and it will be the first time the capital of Catalunya will host a WRC round. Based on the seaside tourist city of Salou, in the famous Costa Daurada, the event will feature some narrow and twisty gravel and asphalt stages -some of them with really low speed average- which are spread around more than 100 kilometres far from the Service Park in the Port Aventura theme park. This year’s edition will be practically identical to 2011 with 405.46 competitive kilometres and 18 stages scheduled; however, it will be introduced a completely new stage with another two which has been run for the last time in 2010. Daniel and Carlos will have a slight approach to the tarmac since the first day of action will feature a mixed surface itinerary. “One of the things I remember the most of this event it’s the lack of grip and poor visibility due to the dust hanging in the air in the first leg. We have to tackle the tarmac roads with a set-up and tyres for gravel. There is a really long stage and t will be a tricky start”, said Oliveira. The second and third days of the event will run entirely on asphalt and that would mean the Stohl Racing squad will have to work harder than ever overnight to get the Ford Fiesta RS WRC into the asphalt trim. “Those will also be really demanding days, especially Saturday with the almost endless El Priorat stage. You have to take care of the breaks and tyres there to ensure your way to the final leg. The luck of grip it’s also an issue due to the dirt pull onto the road when cutting the curves”, added Daniel. The route. The rally kicks off with two full gravel speed tests on Friday, the brand new Gandesa stage (7km) and Pessels (27.59km), before the famous Terra Alta, a test which has had an extra eight kilometres added. This is the longest mixed-surface stage of the rally with over 44 kilometres. A short stage through the centre of host town Salou has been also included to finish the day. Besides the famous El Priorat (45.97km), the organizers decided to repeat Riba-roja d’Ebre (14.20km) for Saturday’s leg and bring forward La Mussara (20.48km) which took place on a Sunday back in 2011. The final day of action will see the return of Riudecanyes (16.35km) and Serra d’Almos (4.11km), which will host the Power Stage, alongside Santa Marina, the longest stage of the leg at 26.51km. The reconnaissance of the roads starts next Tuesday until Wednesday, whereas the Qualifying Stage which take place in Salou on Thursday morning. At night, the crews will kick off the rally in the Cathedral of Barcelona. The season final rally in the World Rally Championship couldn’t be more nerve breaking. Mads Østberg and Jonas Andersson is ready to fight to keep their overall standings as number three. This season the duo has accomplished amazing results. Even though they had to skip two rallies Østberg is number three on the overall standings before this years last rally is to begin in Spain. With Mondays test and two days of recce the duo is still working on the pacenotes late Wednesday evening. Thursday it’s time for shakedown before it all starts on Friday on gravel. Friday evening the Ford Fiesta WRC will be converted from gravel to tarmac for tarmac surface on Saturday and Sunday. – Before coming to Spain the focus has been everywhere else than on this rally, with the season coming to an end. That’s why my focus now has been towards making this rally as normal as the other once, Østberg says. Last year the duo came sixth in Spain. This time it has to be better. But Østberg isn’t focusing on a certain position, rather a certain competitor only four points behind him. – We have to beat Jari-Matti Latvala and we have to push hard to do it. This rally is all about the championship standings, so that’s where the focus will be, Østberg says. Over 405 timed kilometres, divided between 18 special stages over three days – and on both gravel and tarmac: the Rally de Espana promises to provide another special highlight at the end of the 2012 WRC season – particularly as Dani Sordo of the Prodrive WRC Team will be back in business and is out to put on a show for his home crowds around Barcelona. As well as Dani, 26-year-old Finn Jarkko Nikara will also drive a MINI John Cooper Works WRC for the Prodrive WRC Team. Jarkko won the Group N competition at this year’s Rally Finland and came home in fourth place at last weekend’s IRC event in Cyprus. Abdulaziz Alkuwari will also start in a MINI John Cooper Works WRC for the Seashore Qatar Rally Team. The final WRC rally of the year gets underway with qualifying at 10:00 (CET) on Thursday. The qualifying stage is driven on both gravel and tarmac. The first special stage (SS1 “Gandesa”) begins on Friday at 07:45 local time. The biggest test comes in the form of the 44-kilometre “Terra Alta” special stage, on which the surface changes three times. As if that were not enough, they must overcome this challenge twice, as “Terra Alta” is driven on both Friday morning and Friday afternoon. A real treat for the fans is the Ceremonial Start in the centre of Barcelona on Thursday evening. All the teams will be presented to the public on the Avinguda de la Catedral, right in front of the impressive Catedral de Barcelona. On Friday evening the drivers will appear on the Platja de Llevant promenade, where they will complete the two-kilometre “Salou” special stage. When the 2012 FIA World Rally Championship season has ended with its last round – Rally Spain (8–11 November) – Volkswagen Motorsport will only have 66 days left before its first run as an official WRC entrant with the new Polo R WRC is coming up at Rallye Monte Carlo. In Spain, the team is fielding two Fabia S2000 cars of the Group’s Škoda brand for the last time. Whereas regular driver Sébastien Ogier continues to rely on the instructions by his co-driver Julien Ingrassia, Andreas Mikkelsen will be navigated by Mikko Markkula (31) for the first time. In order to prepare for the WRC entry in competitive conditions Volkswagen has been running during the whole season, except at the Rally New Zealand, in the Super 2000 category. “The Volkswagen Motorsport team has had an eventful and instructive year. With our WRC runs, we entered new territory. The results, which were often outstanding, show how well the whole team has meanwhile adjusted to this commitment,” says Volkswagen Motorsport Director Jost Capito, taking initial stock of the season. “Naturally, we want to continue this way in Spain. After eleven class victories so far, completing the dozen would be further confirmation of our work. With their one-two class result and positions five and seven most recently in Sardinia, our drivers not only demonstrated their exceptional speed but also showed that they’re capable of taking their cars to the finish intelligently and quickly, and safely as well,” says Capito. The 28-year-old Frenchman last caused a stir at Rally Italy when he was the first driver of an S2000 car to succeed in setting a fastest time against the WRC competitors with more horsepower. In Volkswagen’s preparatory season, Ogier, to date, has clinched as many as ten S2000 class victories and has even scored 41 points in the drivers’ world championship in the process. The new champion of the Intercontinental Rally Challenge (IRC), Andreas Mikkelsen, will be at the wheel of the second Fabia S2000 fielded by Volkswagen Motorsport for the seventh time this season in Spain. “It’s a great feeling to be travelling to Rally Spain as IRC champion,” says the Norwegian. I last drove in Spain in 2008, but that was only on gravel back then. This will also be my first rally with my new co-driver Mikko Markkula. I’d like to thank Ola Fløene for the fantastic teamwork. Now I’m looking forward to the new challenge with Mikko. Our main goal is to find a good rhythm. But of course I want to stay on Sébastien’s heels like at the last rallies,” says Mikkelsen. 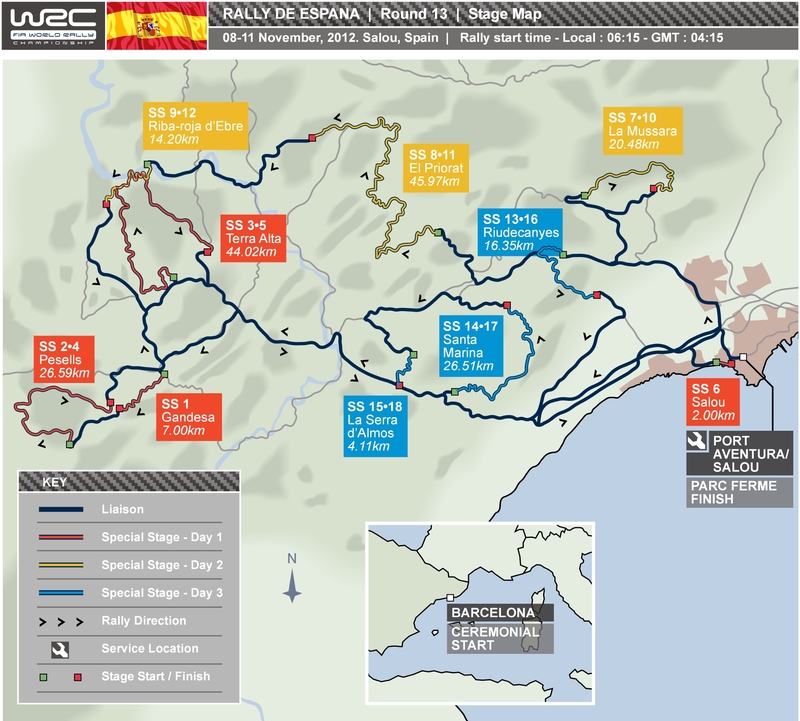 In Spain, 18 special stages covering a total of 405.46 kilometres are awaiting the WRC contenders. The rally starts on Thursday (8 Nov) with qualifying in Salou. In the evening, at 17.30, the Ceremonial Start will take place in front of the cathedral in Barcelona. On Friday morning (9 Nov), rally fans should rise early as the first special stage starts at 7.45. The 18th and last special stage begins on Sunday (11 Nov) at 13.49. The podium ceremony is scheduled to start in Salou at 15.02. PROTON Motorsports driver P-G Andersson knows Super 2000 victory on next week’s Catalunya Rally will be enough for him to secure a third world championship title – and a first SWRC win with the Malaysian manufacturer. World championship glory is nothing new to PROTON or Andersson. The Malaysian firm conquered the PWRC title with Karamjit Singh in 2002, while P-G won the Junior World Rally Championship in 2004 and 2007. Andersson and his PROTON Satria-Neo S2000 have been among the SWRC pacesetters throughout the season, with the Swede leading the series for much of 2012. And now, the championship battle goes down to the wire on the asphalt and gravel stages inland from the event’s base in Salou. The event starts next Friday (November 9) and finishes three days later and with the champion crowned in the middle of the coastal resort. Next week’s rally will be the seventh and final round of PROTON Motorsport’s 2012 SWRC programme. With two victories and podium results on five of the six rallies contested this year, Andersson and PROTON are in confident mood ahead of the Catalunya Rally. The event itself is unique in this year’s championship, in that it is the only round which runs significant gravel and asphalt mileage. The opening day of the rally runs largely on the loose on the event’s most westerly roads, but the weekend is all about the asphalt. A new innovation for this season will be a Friday night stage through the streets of Salou – a test bound to be a big hit with the vast crowds of Spanish motorsport fans who regularly turn out for their round of the World Rally Championship. This year’s Catalunya Rally has moved back by two weeks and runs as the final round of not only the SWRC, but also the main World Rally Championship as well. The shift in date could bring more changeable weather as the event winds its way into the hills of Tarragona. Whatever the weather, PROTON Motorsports will be ready for the conditions, having carried out extensive asphalt and gravel testing in preparation for the event – with the team also running a final set-up check for the two factory Satria-Neo S2000s on Monday (November 5) next week. Malcolm, Ford not continuing its sponsorship within the WRC has been big news over the past few weeks. You have said that you [M-Sport] will continue competing – what is the plan for 2013? The plan is to try and stay at the highest possible level. I can’t tell you anything at the moment, there are a lot of negotiations going on, but we are realistic and hopeful of going on – but I can’t divulge anything. There’s a lot of speculation that you are talking to Qatar? There’s no question we are speaking with Qatar along with a lot of people, but we’re not in a position to confirm anything. In terms of driver line-up, what is your plan? There’s no question, when you’re in this job you want the best drivers for the best job; now with no disrespect to the drivers, this is not my priority at the moment. I need to get the team in a place to be competitive and then we’ll look to get the best possible drivers in place. How confident are you of getting sponsorship? Good question and I can’t answer. This is always a big challenge, but this is bigger than before. You and Ford have been intrinsically linked over the years, what are your best memories? There are so many; we talked about them last night [at Ford’s media function]. The fact that, when we got the contract, we had 18 staff and 76 days before Monte Carlo, but we then ended up taking 100-odd people to Monte 76 days later. Like any business, we have made mistakes along the way, but when we got the victory in Greece  with Carlos [Sainz] and Juha [Kankkunen] and I had to implement team orders… that was a new challenge. There were some great highlights: when Colin [McRae] won on the Safari  on only the third event in the Focus, and then when we took the Championship in New Zealand for the first time , that was the icing on the cake. As well as that, I have worked with a lot of young drivers and got them to victory – seeing them progress has been fantastic. There have been so many memories down the 16 years. Well, obviously I will try as hard as possible. I’m not here to secure fourth or fifth, I’m here to fight with Jari-Matti [Latvala] for the third position and we will give everything we can. How do you feel about the Tarmac stages? The last day in France was quite good, we went well. Before the event I went to Le Mans to do a drive day in single-seater race car. Hopefully this has helped a little bit – I hope to fight on the gravel as well. But to fight with Jari-Matti is hard; if he’s in the right mood, and he stays on the road, he is fast. I see no point in not doing it [risking everything]. Either we make it or we are not third anyway. It’s worth taking a bit more risk. What is the future for next year? It is no secret that you have been linked with M-Sport and Citroën – where will you be? We are definitely trying to get the good position for next year and I want to be in a top-level car with a good team and I think it’s possible. Nothing is clear yet, this rally is important to show what we can do. We don’t know what is happening. We will do our best on this rally and then we hope to do something good next year. So, you’re focused on the here and now? For sure. There’s been a lot of talking lately – we need to leave that now and focus on the rally. Next year is some months away, we have plenty of time. Sébastien, your final event of a full WRC season and where you have sealed your ninth Championship title. Any regrets? No I didn’t change my mind. I am still on the same plan and yes I realise this is the last full season. For sure there will be some rallies next year – so this is not completely the last rally. But this is what I wanted. The decision was not easy, but I am happy at the moment with this decision and I look forward for the future to do some different things. I didn’t change my mind. So, how many events will we see you on next year? In France you said ‘a few’, but we now hear that figure may have risen to seven? Maybe it’s going to be 12! I nearly made a decision: it’s between three and five – I didn’t hear seven, but everything is possible! This is a rally I won a lot of times but since last year it’s more complicated with the gravel day. Before it was full Tarmac and then we have the gravel which makes it not so easy, but we could win. I will try, there is no pressure, we are here for fun – we will push for sure. Are you giving any input on who you think the second driver should be? If it were your choice who would it be? I think you will not have any answer from me… I cannot say anything. There is nothing to say. If you were picking the driver? I don’t pick the drivers! Dani, final event of the year for you. Last year you were fourth in the MINI, do you feel you are able to challenge for a win this year? After my start in France and Germany it could be difficult to fight for the victory, but we are here for the fight. We will see tomorrow. We will go at the maximum and be as high as we can. I feel well. Qualifying went well and I was happy with my driving at shakedown. How would you assess a season which has seen you drive for two teams! This is my second season [with Prodrive WRC Team]. Normally the first season with MINI was like this, but then normally this year we should have two cars and two drivers, but after the people couldn’t find the sponsors, it was difficult for everybody. But after this we do as much as we can with the development on the car. It’s difficult to compete with the people who are doing this every day, but this is the car and team we have at the moment, so we have to fight with the others. Your name has been linked with Prodrive, Citroën and M-Sport for next season – is there anything you can tell us about next season? It’s difficult, but I try to fix the future as soon as possible. But for now I want to focus on the rally. Do you want a full season next year? I want the testing, the car and I want to fight for the victory. Benito, an incredible season of PWRC action which means there are multiple drivers who can win the title here! But, it’s you who is in the lead of the Championship. How are you feeling? I feel really comfortable here. I think this is like a home event for me. I have been here racing for three years and I feel confident on these roads. I think I am fast and I think I can be on the same pace as Michal [Kosciuszko]. We will have a long weekend. I don’t have to win the rally, but I have to be in a podium place to win the world title. Rally Italia Sardegna did not get off to a good start for you or your team-mate; that cannot happen here! We both hit the same rock in the same corner – it was incredible. Our boss was amazed that we could both hit the same thing. We were both stuck in the stage and it was the biggest day of our career. We have to be concentrated on our driving and take enough points for the title. What would it mean to win the title? It would mean everything. Nobody has won a world-class Championship in Mexico and in America only one person, it would be great and it would open doors with new sponsors in a new category. Michal, 11 points behind Benito in the Championship – but it is still all to play for here. Feeling the pressure? Not so much. It will be a very important event for both us, but there are four other drivers who can win the Championship as well. It’s an excellent way to end the season with two kinds of surface – you can see who is quicker on Tarmac or gravel. It’s amazing and it will be a nice battle between me and Benny [Guerra]. For sure, it’s different for us: we have to win it, but he has to finish on the podium. I can drive my car but not his. I wish him the best, he’s a lovely guy, but the friendship can wait when the fighting starts tomorrow morning. Is it a ‘flat-out, risk everything’ strategy? It’s very simple, I have to be quicker on each stage than the others – but I also have to follow Benny’s results. I believe it’s possible. It’s going to be a competitive weekend for a lot of drivers. It’s not going to be easy, but it is going to be important. Craig, final round and it is the battle for the SWRC title between yourself and P-G Andersson. How are you feeling ahead of the event? Yes, there’s some pressure. It’s been a very difficult year for more than one reason. It’s been a weird Championship this year. It’s been a fight from the start, but there has been lots of superally and lots of problems. But now we forget what’s gone before. This is a rally I quite like, it’s the mixed surface like last year and that’s quite nice. I feel quite confident. I hear you have been training hard for this event – what have you been doing? I suppose when the opportunity came in France – the lifeline – I wanted to leave no stone unturned. I wanted to put in every possible effort to be in the fight. So, on the Monday morning when I got home from France… actually when I got home from Sanremo, then I got cracking and started to squeeze every last drop of fitness out of myself. I’m reaping the benefits physically now, I feel in such good shape – hopefully this will pay back tomorrow morning. What will be the strategy from you here – P-G [Andersson’s] not far behind? With the mad Swede so close, it can be quite difficult. Maybe we need to do something drastic, but nothing we’ve not done before – we’ll see how things progress on Friday. I quite like the long stages, but I don’t want to leave all the hard work for Saturday morning. It doesn’t need to be flat-out, I need a good pace, but P-G will be pushing hard. Let’s see the first couple of stages tomorrow. What would it mean to you to clinch the SWRC title this year? P-G, you are second in the SWRC just two points behind Craig. We have seen you battle for Championships many times in the JWRC – does the pressure change as you get older or is it as intense as it ever was? I don’t know. I always like a win and not to lose the battles – that’s happened too many times! I will try to be as close as possible to Craig, but it’s very difficult to be ahead. Tomorrow is my day and I will go from there. You feel more at home on the gravel? For sure. I’m quicker and the car is slightly quicker on gravel than Tarmac. I will give it a go. But the stages are fast and it’s hard to make up time on those kinds of stages. Have you tested prior to this event? How have you prepared? Er… I have been babysitting quite a lot. I’ve been taking care of the family – so I’m well prepared! You have Alastair Fisher as a team-mate this weekend, how much can he help you? I don’t think he can help me at all. It’s whoever is in front of the other one in the Championship. If one makes a mistake and retires, then it’s game over. It’s quite weird when we have all retired so many times then come back with superally. You think you’re out of the Championship and then you are back in. I just hope nobody has any problems and we can all go for it. You claimed the JWRC twice in your career, what would it mean to seal this one? It’s a great feeling. It can help the team quite a bit. I think we have proved we’re quick enough. Brendan, the FIA WRC Academy title may be sealed already but there is still a lot to play for on the final round – the battle for second position between you and Jose, and the co-drivers title which Rhiannon could win – no pressure for you then! No, not at all! All this year we’ve been trying for podiums, but Elfyn’s won the Championship, so there’s relief that that’s gone so now we can focus on this rally. We were here for the selection event in the Pirelli Star Driver in 2010. I’ve got a good feeling for the roads, I like the smooth Tarmac stages, but this event will be hard on the car – especially the long stage, we’re really going to have to watch the brakes in there. How would you assess your season? Will you be back next year for the Junior WRC Championship? There’s been lots of small mistakes when you look back and you think: “I could have done it better.” But there’s no point in that; I have to look forward, to take one step in front of the other. We’ve come a long way, competing all the way from Australia and we’ve prepared ourselves as well as we could: I’ve been eating my water melons and riding my bike. And what about next year. Any plans? We’re looking at everything, until a few decisions are made we can’t decide, but we want to stay in the WRC, this has been great for my career. I feel I’m getting faster and faster and I’m sure you’ll see us out there next year – I’m just not sure in which category yet. Jose, home event and one you have competed on in the past, how are you feeling ahead of the event? I am very confident, this is my home rally. I live 1,000km [100km] from here, but I have waited [for this moment] and will do the rally in front of my people. I don’t know what I can do. The stages are quick. I was here two years ago, in a Fiesta as well. It’s going to be very difficult, Brendan is very fast in this position. To drive to the limit. We will do everything we can. We have to go flat-out on gravel and on Tarmac. And what plans for next year? I want to find some money and not stay at home. I want to do rallies. After a treacherous opening day of competition in Rally de España, Mads Østberg heads the leaderboard, the Norwegian 27.2 seconds ahead of reigning World Champion Sébastien Loeb. After an up and down start to the rally, Jari-Matti Latvala has climbed from fifth to third this evening. The final round of the FIA World Rally Championship got underway last night when the crews travelled to Barcelona for the start ceremony located – for the first time – in the capital city of Catalonia. Rally de España is the only true mixed surface round of the series, with the first of three days of competition run largely on gravel and the following two days contested on asphalt. At the end of today’s five gravel stages, the day was rounded off with a mixed surface super special stage on the seafront in Salou, another new addition to this year’s event. Tonight, final service was also extended to give the teams the opportunity to change the cars from gravel to Tarmac specification for Saturday and Sunday. Rain added to this morning’s challenge and with a lot of standing water on the stages, both road position and tyre choice proved all-important. Latvala took the early advantage by winning the opening stage but then a spin lost him over 10 seconds, dropping him to fifth. He has gradually climbed the leaderboard as many rivals have fallen by the wayside or opted to simply try and survive the opening day. While Østberg tops the classification, he too has not escaped unscathed and has set an impressive pace despite being on the wrong tyres this morning. A spin also cost the Norwegian time but he has nevertheless pulled out a useful lead as the event now heads to its traditional asphalt stages. Behind him, Loeb has also had some moments during the day but has climbed from fourth to second, 19.8 seconds ahead of Latvala. Fourth-placed Mikko Hirvonen has been off the road once but holds fourth ahead of Ott Tänak. The Estonian was another early rally leader and stage winner, but dropped from second to fourth with a spin and brake problem. He is fifth overnight with nearly five minutes in hand to Craig Breen, who has been setting a fine pace in his less powerful S2000 car. He inherited the position from fellow S2000 driver Sébastien Ogier, who retired before the final stage with a suspected engine problem. Leading retirements of the day include Petter Solberg, who hit a rock stuck in a hole in SS2 which damaged the suspension and forced him out of fourth position, Chris Atkinson who retired with steering related problems, Evgeny Novikov who went off the road and Thierry Neuville who suffered the same fate as Solberg. Dani Sordo, Daniel Oliveira, Paulo Nobre, John Powell and Martin Prokop were all also forced to retire. The top of the Rally de España leaderboard has turned on its head during the second day of competition and Sébastien Loeb has powered into the lead in the Citroën DS3 WRC. Jari-Matti Latvala has moved into second for Ford, with Mikko Hirvonen third. Mads Østberg, who set a fine pace yesterday and topped the standings overnight, has slipped to fifth. Today’s route took in two identical loops of three stages covering 161.30 competitive kilometres, not only the longest day of the event but including the longest stage of the rally (45.97 kilometres). While admitting last night he was unlikely to be able to hold off Loeb on Tarmac today, Østberg maintained his lead through the first stage but dropped to third in the long El Priorat test when hard tyres proved the wrong choice for wetter conditions than anticipated. He went off the road once, brushed a barrier and lost over a minute. Things got no better during the rest of the day as the Norwegian struggled with the handling of the car and ultimately dropped to fifth. Having established himself at the head of the leaderboard, Loeb then extended his advantage over Latvala this afternoon, the Finn forced to concede that the Frenchman remains untouchable on asphalt. The pair is now split by 27 seconds going into Sunday’s final day. Mikko Hirvonen has moved into third after a trouble-free day and Ott Tänak was able to overhaul Østberg in the final stage with a fastest time. Dani Sordo – continuing under Rally 2 regulations – has set two fastest times this afternoon after electrical problems this morning. Even so, the Spaniard remains well outside the top 10 after his Friday crash. The final round of the 2012 FIA World Rally Championship – Rally de España – was won by the Citroën Total World Rally Team crew of Sébastien Loeb and Daniel Elena, providing a fitting exit for the reigning World Champions on their final event full-time in the WRC. It was also their eighth consecutive victory in Spain. Second position was claimed by Ford’s Jari-Matti Latvala and Miikka Anttila with Mikko Hirvonen and Jarmo Lehtinen taking the final podium position. In the FIA World Rally Championship, Sébastien Loeb and Daniel Elena claimed their ninth title* on Rallye de France-Alsace two events ago, and Mikko Hirvonen and Jarmo Lehtinen were assured second after claiming their first victory of the season on the penultimate round in Italy. Third in the Championship was fought out in Spain and Jari-Matti Latvala and Miikka Anttila narrowly claimed the plaudits ahead of Norway’s Mads Østberg and Jonas Andersson. In the Manufacturers’ Championship, Citroën also claimed the title in France*. Today’s route included two identical loops of three stages covering 93.94 competitive kilometres, the penultimate test counting as the Power Stage. Here, Latvala, Dani Sordo and Loeb claimed the additional points for setting the fastest times in this single stage. Loeb has maintained his advantage throughout the day, with Latvala closing the gap to just seven seconds this afternoon. Hirvonen was in the midst of a battle with Østberg but the rivals held their third and fourth positions respectively. Jarkko Nikara completed a fine event – his first in a world rally car – in fifth position and Craig Breen rounded off the top six in his less powerful Ford Fiesta S2000 car. He also claimed the FIA Super 2000 World Rally Championship title*, just one year after winning the FIA WRC Academy Cup. Mexican Benito Guerra won the FIA Production Car World Rally Championship title**, having taken maximum points on the final round here in Spain. The 2013 FIA World Rally Championship kicks off with the famous Rallye Monte-Carlo (15-20 January). Sébastien Loeb, Daniel Elena and the Citroën Total World Rally Team finished the season in the same way as they started it: on the top step of the podium! The statisticians will note that in winning the Rally de Espana, the Franco-Monegasque crew notched up their 76th career win, whilst Citroën can now boast some 90 WRC victories. Quick and consistent throughout the weekend, Mikko Hirvonen and Jarmo Lehtinen finished third overall. So, an exceptional year draws to a close for the Brand, in which it recorded its eighth Manufacturers’ title* and its first-ever one-two finish in the World Championship thanks to Sébastien Loeb, World Champion for the ninth time running, and Mikko Hirvonen. Having established a half-minute lead over Jari-Matti Latvala on day two, Sébastien Loeb and Daniel Elena could look forward to the final day in a relatively relaxed frame of mind. As the Riudecanyes, Santa Marina and La Serra d’Almos stages were more or less dry, the Citroën Total World Rally Team DS3 WRCs were fitted with hard Michelin Pilot Sport tyres for the first loop of stages. Whilst Dani Sordo wowed his home crowd by winning all three of the morning’s stages, Seb controlled the race from the front by aligning his times with those of Latvala. After the morning’s 46 kilometres of stages, the nine-time World Champion has only lost 2.3s to his Finnish challenger. “Dani is really pushing. He probably wants to prove that he’s just as quick as ever. As far as I’m concerned, I just tried to keep up a good pace and not make any mistakes. It went well, but I don’t really enjoy driving like that. I ended up almost having more scares than when we are really pushing hard,” confided Seb at the service park. As thick clouds gathered above the Costa Daurada, the Citroën cars headed off to tackle the second loop with a mix of soft and hard tyres. On SS16, Sébastien Loeb lost four seconds due to a slow puncture picked up shortly before the end of the stage. The rain forecast for SS17, in the end, came to just a few drops. Having to tread carefully given their tyre choice in these conditions, Seb and Mikko lost a good portion of their respective leads! There was, however, only one 4.11km stage left to complete and the overall standings remained unchanged after this final stage. Ford World Rally Team drivers Jari-Matti Latvala and Miikka Anttila finished second in Rally de España today to secure third place in the 2012 FIA World Rally Championship. The Finns ended this 13th and final round of the series just 7.0sec from victory in their Ford Fiesta RS World Rally Car to clinch a top three series finish for the second time in their careers. The team had already confirmed second place in the manufacturers’ standings and Latvala’s podium ended an emotional weekend for Ford at the Blue Oval’s final official WRC appearance. Team-mates Petter Solberg and Chris Patterson finished 11th in a similar Fiesta RS WRC. Rally de España is the only mixed surface round in the championship and offered 405.46km of action. Based in Salou on the Costa Daurada coastline near Barcelona, it comprised an opening leg of gravel speed tests before two days of competition on smooth, wide, circuit-like special stages. Friday’s loose-surface roads provided one of the most savage days in recent years. Heavy rain made conditions treacherous with mud and standing water making survival the name of the game. Conditions deteriorated with the passage of every car and Latvala’s low start position left him at an even greater disadvantage than many. However, the 27-year-old Finn kept his cool to end the day in third and climbed to second early yesterday as the rally switched to asphalt. He began today’s final leg 27.0sec from the lead but two fastest times enabled him to close the gap, maximum bonus points for victory in the Power Stage ensuring third in the title standings. “After such a difficult season, third in the championship means a lot to me, especially after missing a round through injury,” said Latvala. “In terms of time, this is the closest I have ever been to a win on a rally that is primarily asphalt. Hard tyres were the right choice for the final three stages and I was closing with every kilometre. One more stage may have been enough for me to do it. “I wanted to finish my career at Ford on a high note and I’m so pleased to have done that. I’ve had many fantastic years here building my career and I would like to thank everyone in the team for their support during that time. I have great memories of my career here that I will carry through my lifetime,” he added. Solberg’s chances of a strong result ended on the second stage when he hit a rock submerged in a water-filled rut. The impact damaged his car’s suspension and he retired from the leg. He returned under Rally 2 regulations with a 25-minute penalty, and climbed from 41st to 11th. Ford World Rally Team director Malcolm Wilson reflected on the event and the season. “It wasn’t the perfect ending, but it was probably as close as we were going to get. Jari-Matti drove well over the final two days. The Fiesta RS WRC is very competitive, and although we were quickest in qualifying on many occasions, won Power Stages and set many fastest times, we didn’t score as many victories as we should have done,” he said. “The important thing now is that we continue to develop the car and I hope we can stay at the highest level next year,” he added. Rally Spain marked Ford’s farewell from the WRC as an official team. M-Sport Ford World Rally Team’s Ott Tänak put in a sensational performance on the final round of the FIA World Rally Championship (WRC) this weekend, only to have his hard work undone by a mistake on the final day. Elsewhere, the 2012 RACC Rally de España ended prematurely for John Powell as he was forced to retire on Day 1 with a persisting ear infection. Impressing behind the wheel of their Ford Fiesta RS WRC over the opening days’ rallying, Tänak and co-driver Kuldar Sikk established themselves as one of the most promising up-and-coming crews in the championship. Having led the rally in its early phase, the Estonian set some strong times on both gravel and asphalt and added a further two stage victories to his year’s tally. With 93.94 km of competitive rallying left to run, Tänak was hunting down his second consecutive podium of the year. In control over the opening stage (SS13), he was on course to close the gap to rival Mikko Hirvonen and increased his lead over fellow Ford driver and former rally-leader Mads Østberg. However, battling with less than perfect pacenotes, the 25-year-old clipped a barrier 15 km into SS14 – losing ten seconds and fourth place in the process. Keeping his composure, the youngster ushered a resurgent comeback over the remaining 10 km to lose just five seconds to Østberg and lay a mere 1.9 seconds adrift of reclaiming his fourth place. But disaster struck through the second pass of Riudecanyes 2 (SS16). Continuing to struggle with the pacenotes, the pairing carried too much speed into a tight right-hander. Running wide, their Fiesta made contact with one of the barriers that line the smooth-asphalt roads and forced an untimely end to what was set to be another strong result for the Estonians. Improving throughout his debut season in the WRC, Tänak has impressed in recent months. Claiming eighth position in the Drivers’ Championship, the youngster has regularly challenged his more experienced rivals for both stage wins and overall positions. This season has also seen the Estonian claim his first Power Stage victory – at Rally Deutschland – as well as seeing him lead his first rally out right – on the first day of competition here in Spain. “It has been a very difficult day for us which only got worse this afternoon. We ran wide on the first stage [this afternoon, SS16] and hit a barrier – I was just carrying way too much speed into the corner. “For sure the event had been going really well before today. We set some good times on the first day and then I had a really good feeling on Tarmac yesterday – the car felt great and I had a lot of confidence on all of the stages. Seventh after day one, Hans Weijs Jr. moved ahead of Craig Breen on the first stage of the day. Somewhat isolated in the overall standings, the Dutchman continued to get to grips with the DS3 WRC whilst gradually narrowing the gap between his times and those of the leading drivers. Weijs Jr. rolled his car during the SS 15 and was forced to retire. The last day of action of the last rally of the year turned out to be one of the best performances for Daniel Oliveira who finished the Rally RACC of Spain and his second season in the FIA World Rally Championship in high spirits. The Brazilian driver and his Portuguese navigator Carlos Magalhaes bounced back from difficult beginning and today they found a good pace on board the Stohl Racing-run Ford Fiesta RS WRC through the Catalonia asphalt roads. Today the threat of rain forced the teams and drivers to take a thorough decision on the choice of the tyres compound since most of the stages were dry, but there were still some damp patches under trees and in corners. The last leg kicked off with a fast and twisty stage which really suited Daniel best. The Brazilian driver had a strong start and just flew through it to set the 10th fastest time on his way down to Riudecanyes. “It was a good start. When you have good grip everything changes”, said Oliveira. However, road conditions began to change in the next speed test as it started to rain when Daniel was on his way through SS14 Santa Marina (26.51km). “It was really slippery and he had to take extra care so as not to make any mistake”, added. More rain was expected for the repeated stages, but before that occured, Oliveira made the most of the good feeling he had in today’s opening speed test to be 9th fastest on SS16 Riudecanyes (16.35km). He improved three seconds over his first run and made up for the loss of time to less than 1.5 per kilometre. The last real challenge was the second run through the Santa Marina test, which host the Power Stage. Later on there was only the short SS18 La Serra d’Almos (4.11km) remaining to finish the rally and Daniel’s second season in the WRC. “I took extra care in the Power Stage. Conditions were really difficult. It was very slippery and I didn’t have enough confidence to push there”, he said. Oliveira finally brought his Ford Fiesta WRC back to the Service Park in the 16th position overall to round a good job in his last outing this year, which also ended with eight points for the Brazil WRT in the Manufacturer Championship. Mads Østberg and Jonas Andersson best rally season has just ended. After the first day in Spain Østberg was leading the rally with almost 30 seconds down to Sébastien Loeb. But Saturday morning, on asphalt, Østberg chose wrong tyres and the setup on the car worked against him. On SS8 Østberg went off the road and lost 40 valuable seconds and dropped down to fifth overall. Sunday things worked out much better and the Ford Fiesta WRC-duo pushed hard and climbed on the resultlist. But Jari-Matti Latvala was too fast and too hard to beat on the Spanish roads. – We’re not disappointed at all, because this has been an incredible season for the whole team and for Mads and Jonas. The team is small but everyone has done an amazing job, which I think is a huge accomplishment, Morten Østberg, team manager in Adapta World Rally Team says. Mads and Jonas had to drop out on two rounds this season but still they were third overall before this years last round in Spain. – This is without a doubt Mads’ best season. No we’re looking forward to the next season, Østberg says. In rounding off the 2012 WRC season Dani Sordo once again proved the big potential of the MINI WRC. On the final day of the Rallye Spain, Dani won four of six special stages. Dani Sordo continued the last day of Rally Spain where he finished on Saturday, by winning four more stages in his MINI John Cooper Works WRC, taking the tally to six. He won all three stages this morning and for the afternoon, with rain forecast, Sordo gambled on running only hard Michelin tyres and it paid off winning the last stage and only coming second on the Powerstage due to the onset of rain. Meanwhile Jarkko Nikara, in his first event in a World Rally Car, finished in fifth place overall, one of the best WRC debuts in recent years, confirming what a great talent he is. After going off the road on the first day’s very wet gravel stages, Sordo returned to competition under Rally 2 on Saturday’s tarmac stages. Unfortunately, on the first stage of the day, a fuel injector failed meaning the car ran on just three cylinders for the morning’s stages. After a heroic effort by the Prodrive WRC Team during service, the problem was fixed and Sordo went out and returned the favour by immediately setting two fastest stage times, showing just how fast the MINI WRC is. Nikara meanwhile was setting competitive stage times in his MINI on the tarmac and steadily moving up the leaderboard during Saturday and Sunday as drivers ahead of him found trouble. Dave Wilcock said: “I have mixed emotions. Really pleased that we have shown just how fast the MINI is and that it is already more than a match for the Ford and Citroen, but also disappointed thinking ‘what if’. If Dani had just come through the first day unscathed and not had the injector fault, we could have been challenging for at least a podium and possibly a win. “Jarkko has achieved an amazing result on his WRC debut. He has driven with maturity and soaked up all the advice we have given him over the weekend. He clearly has what it takes to become a world class driver and follow in the driving boots of the other great Finnish drivers. Wolfsburg (11 November 2012). In a way it brings back memories of an old adage that says, “When the dress rehearsal flops the premiere will be all the more successful.” Although the season’s closing event at Rally Spain did not go so well for Volkswagen with the Fabia S2000 cars of the Group’s Škoda brand it is contrasted by a total of eleven class victories in the previous WRC rounds and the eager anticipation of the debut with the Polo R WRC car at Rallye Monte Carlo on 15 January 2013. On the Costa Daurada, factory driver Sébastien Ogier and co-driver Julien Ingrassia (F/F) were forced to retire at the end of the first day on account of a problem with the drivetrain. Due to an accident Andreas Mikkelsen and co-driver Ola Fløene (N/N), the champions of the Intercontinental Rally Challenge (IRC), finished the total of 1,391.73 kilometres in 21st place according to Rally 2 Regulations. Before the start of “Monte”, tests in Mexico, France and Sweden are still on the agenda for the Volkswagen team. After a tremendous ceremonial start in front of the famous cathedral in Barcelona the drivers were in for difficult, slippery track conditions around the small coastal town of Salou the next morning. Sébastien Ogier as well as Andreas Mikkelsen set a strong pace on the first special stage. Both managed to minimise the gap to the more powerful WRC cars. Afterwards, though, misfortune took its course on the second special stage (SS): First, Ogier lost valuable time because the bonnet of the Fabia lifted after running over a bump in the road. Shortly afterwards Mikkelsen was struck, who like rivals Petter Solberg and Thierry Neuville hit a stone with full force – resulting in suspension damage. In the evening, shortly before the start of SS6, Ogier/Ingrassia had to park their car with a drivetrain problem, which meant the end of the rally for them. Only Mikkelsen, after a successful repair, was able to finish the remainder of the rally under the so-called Rally 2 Regulations and, by setting consistently fast times, gathered valuable experiences for 2013. PROTON Motorsports has ended a fine debut season with second place in the FIA Super 2000 World Rally Championship after an astonishing run of six podiums and two wins from seven events. The Malaysian manufacturer took second and fourth places in SWRC standings of Rally de Espana, which ended in Salou this evening (Sunday). P-G Andersson was the runner-up, having led the event on the opening leg, while Alastair Fisher turned in an impressive debut in the second Satria-Neo S2000, taking fourth at the end of the World Rally Championship’s only true mixed-surface rally. Having won two rallies, Andersson arrived in Spain among the favourites to take what would have been his third world title – but he missed out finishing just nine points shy of Craig Breen’s winning total. P-G’s co-driver Emil Axelsson did, however, win the co-drivers’ SWRC title. The Spanish SWRC round turned out to be a fittingly challenging finale to what has been a thrilling season of competition. Heavy rain arrived in the Tarragona hills on the eve of the opening day, leaving the crews struggling for grip in some of the most treacherous conditions of the year. But, by the time the PROTONs arrived on the seafront in Salou on Friday evening, the rain had stopped, allowing P-G and Alastair to thrill the thousands of fans who had turned out to watch the town centre test. P-G set a blistering pace through Friday morning, but slipped back from the lead when he was caught out on Friday afternoon, spinning the car and dropping time to Breen with resultant suspension damage. The PROTON team switched the cars from asphalt to gravel specification for the weekend, but the gap was simply too big between first and second and the two-time Junior World Rally Champion remained where he was. The cars ran faultlessly through the super-quick switchback Catalan asphalt stages, allowing P-G to maintain the team’s exceptional run of podium results in its debut season of Super 2000 rallying’s highest level. Sébastien, congratulations! How do you feel at the end of your full-time WRC career? help me when I stop the rally career. Will you come to Rally de España next year? Have you pushed at 100 per cent on this event? choices – it’s been a very difficult rally. Have you been able to enjoy this rally? or are you able to take a break? Congratulations Daniel, what was this rally like for you? and the choice of tyres. Next year, what plans for you? Chardonnet. But we also have some tests and rallies. And then I look to the FIA to ask if they want help for the future. Your last event for Ford, and Ford’s last event; how do you feel Jari-Matti? Can you work on things for the future? I know the weakness areas and I work on them. when you are pushing and you will go off. It’s a difficult situation about knowing when you can push. We have seen good times from you on the Tarmac here, you must be happy with that? really like to do this. You switch to Volkswagen soon, can you tell us when? are doing the WRC programme for Ford and now after this rally, it’s finished. Of course it is natural that it’s emotional. Sport and Malcolm said: “Welcome on board, you are part of the future of the team.” They are great memories. Third for you Mikko. How do you feel about that result? okay, we were consistent and we made the podium, this is nice. Why weren’t you quick enough? I don’t know how to brake! Sometimes it’s really good, but then in some stages I just can’t keep it consistent enough. You will be number one at Citroën next year. Ready for that? and I’m really happy to be part of such a strong team. I’m going to be ready and I’m really looking forward to it. Can you get any tips from Sébastien before he goes? I’m going to steal his shoes! settled well in the team and I’m happy. Jarmo, what do you think of the first year? Yeah, I’m really happy. Maybe on this one, Wales and Sweden I would like to have been a bit quicker, but that’s how it is. Can you tell us anything about who will be in that second seat next year? final decision; it will be maybe tonight or maybe next week. We are looking between Mads Østberg and Dani Sordo. Did you look at the results they achieved here? Who impressed you most on this rally? Sébastien, did ever think of achieving so much success? years were coming and going and I won every time, but for sure I couldn’t imagine to be at that level today. Jari-Matti, what are your thoughts on next year’s Championship? will be big and this will be a big challenge. This is a fantastic result Craig and what you wanted at the start of the season. How do you feel? How did this compare with the pressure on you to win the FIA WRC Academy Cup last year? light flashed in the car it sent a bolt through me. At the finish the emotions were there straight away. Paul has helped to keep you calm? Paul, Craig says the results speak for themselves. How has it been for you? have a four-minute lead and then spend two days keeping our nose clean: a lot of drivers couldn’t do that at any age. You’ve seen his confidence come back this year? like changing all the suspension and the car from gravel to asphalt on Friday night. Emil you are the winning Championship co-driver. Tell me about your weekend? play a mental game, but he is strong and we couldn’t catch him. Was it hard motivating yourselves when you were so far back? way to go. Congratulations to Craig and Paul, they did a fantastic job. the ladder. We’ve got more to go to get to the top. to be at the press conference at the end. I am really happy. It was a strange event though – so many drivers could win. A lot of pressure? PWRC, and I’m very happy to win. Do you know much about your plans for next year? cannot believe what is going on. In two weeks, I’m sure we will know what’s going on next year. This must be a great feeling for you Borja? It is a great feeling, more especially to win in Spain with all the spectators. The rally is really important for me. Quite a relief when you crossed the finish of the last stage? Has it been the perfect year? Benito, it’s 41 years since a Mexican won a World Championship, what will this do for the sport in your country? Candido, many congratulations on becoming the winning co-driver in the FIA WRC Academy Cup. How are you feeling? through the whole season. He has just been improving all the time and getting better and better with every rally. And to take victory on home soil must feel good too? example – maybe one day I can be as good as him too!